Allyson Geer, medalist in the 2014, 2015 and 2016 Michigan Women’s Amateur. 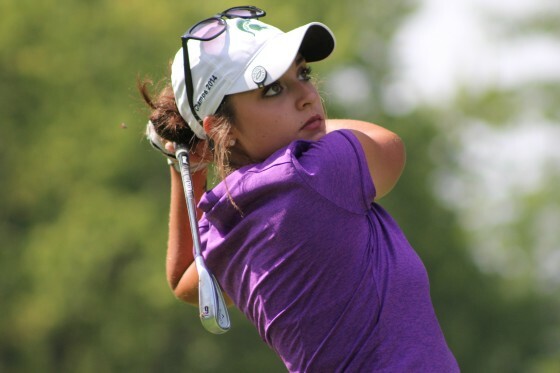 LINDEN – The Michigan Women’s Amateur Championship has become Allyson Geer’s favorite tournament of the year, and not just because she won last year and has earned qualifying medalist honors for three consecutive years. Geer, 17, shot a 2-under 70 Tuesday for a 1-under 143 two-day total, and earned the No. 1 seed as medalist for the start of match play Wednesday in the 100th edition of the state championship presented by Carl’s Golfland at Spring Meadows Country Club. Geer finished one shot ahead of University of Michigan golfer Emily White of Saline, who shot 71 for 144 and the second seed. Jacqueline Setas, a Michigan State University golfer from East Lansing who shot 74, and Morgan Smith, an Oakland University golfer from Muskegon, who shot 73, were next at 148. Dearborn and Loyola University Chicago golfer Elayna Bowser, the first-round leader, followed up her 69 with an 80 for 149 where she was joined by University of Wisconsin golfer Aya Johnson of Muskegon, who shot 73, and Western Michigan University golfer Kaitlyn Watkins of Frankenmuth, who shot 70. Geer, who played the back nine first in the second round, said her iron play was improved in round two, and she turned in one of her best shots of the summer on the par 5 No. 6 hole on the way in. Geer, who has a year left of home school before joining Michigan State’s women’s program in 2017, feels her game is coming to together for match play. Geer was paired with her future college coach, Stacy Slobodnik-Stoll of Haslett, a two-time state champion who shot 74 for 151 and a tie for ninth over the two days. White, who is 19 and has the same birthday as Geer (Aug. 15), will be a junior at Michigan in the fall. She feels like her game is coming together at the right time, too. White, who has stuck to a pre-tournament game plan the first two days, doesn’t think she will change strategy for match play. The 36-hole cut to the low 32 scorers for match play fell at 158. Natalie Johnson of Clinton Township won the final spot in a three-golfer playoff for the last spot with a par 4 on No. 9. Johnson as the 32 seed meets Geer at 8 a.m. off No. 1 tee Wednesday. The “Sweet 16” will be determined with one round of matches. The round of 16 and quarterfinal matches are Thursday, and semifinal and final matches Friday.